Microsoft Exchange server is always surrounded with uncertain database errors & sudden crashes. Very commonly encountered issues are: Dirty Shutdown, Database Mounting Failure, GUID Mismatch, Jet Engine Errors (Read & Write), Log files errors, internal service failure etc. Thus a definite solution is to convert exchange to outlook data for dealing such issues. For conversion, use a latest technology based Software. The product supports modern data structure and provides option to convert either particular or multiple or all mailboxes and public folders from offline (dismounted) & corrupt EDB file with 100% accuracy. Microsoft Exchange to Outlook Converter is embedded with updated scan engine that repair highly corrupted EDB file bit-by-bit and recover permanently deleted mailbox items. Exchange to Outlook product has simple Graphic Interface and functionally supports Exchange 2013, 2010, 2007, 2003 and later version. Deeply scan EDB file (bit-wise) to debug all Run time and Jet Engine errors. Then auto-repair highly corrupt and inaccessible file segments by keeping the original information intact. 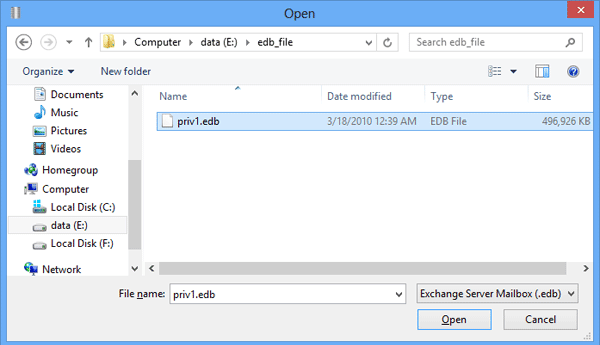 Recover all Public Folder data (even Pub.EDB is corrupted) and save into PST file without losing any info. Import pub.edb in outlook with same structure of root folders and sub folders. Tree-Shaped-List holds all edb items, expand desired folder to analyze items & item-count. 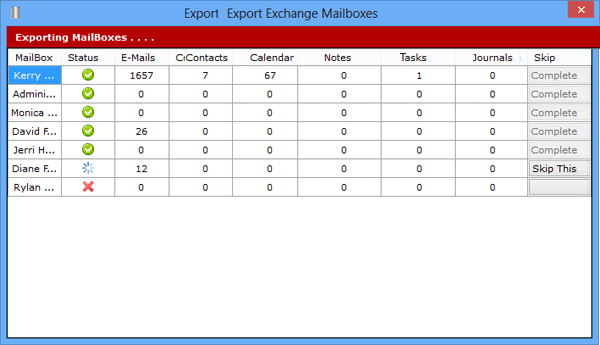 From the list, select and convert all emails, calendars, contacts & tasks from Exchange to Outlook PST file. During conversion process of Exchange to Outlook,restore shift deleted, purged & permanently deleted items from Dumpster folder even when Retention Period has expired. Import EDB to Outlook PST file with advanced facility to save emails with original creation time & date, message subject, sender & recipient address, bcc field, attachments & appointments. Use 'Skip This' button to stop exporting of any mailboxes in-middle of running process. Also Exclude / Include any mailbox prior to start data conversion. Get total count status of exported item. Check screenshots to understand the software functionality, to convert multiple EDB files to Outlook file format. In just 3 steps, you can convert any number of EDB files to PST format. Step 3 :Currently running EDB file conversion process. Does it need a live Exchange server to export files into PST? No, it does not require a live server environment to migrate files into Outlook PST Format. 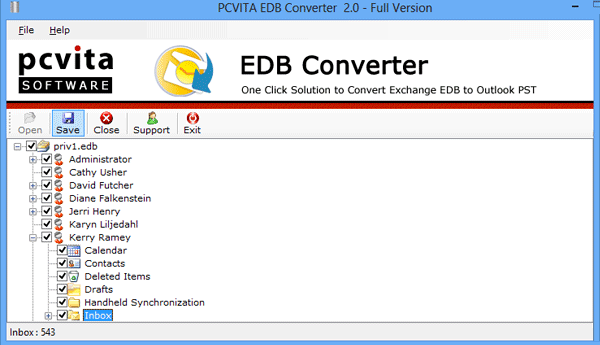 Only EDB files are required for the conversion. Can i convert my password protected EDB files into PST file format? Yes, our software provide you the facility to convert your password protected Exchange server files. Moreover it facilitates you to migrate corrupted, hard deleted files too. Is it possible to convert only public EDB Folder into PST File format? Yes, Exchange to outlook tool can convert both public and private mailboxes very efficiently and with precision. "I started using this tool a while back, and i am completely satisfied with it’s functionality.Its was perfectly clear what to do next and and what the software is performing at times.Its simplicity and ease of use, are the factors that makes it different from other conversion tools." "I was looking for a tool to convert my exchange server files into outlook as i have wasted a quality of time using Power shell commands without any proper results. Then i come across this conversion tool. It migrates the files very effectively." "Earlier i purchased your repair tool and it worked great for me. And recently i was in need of exchange file converter as i have accidentally deleted my folder.Therefore i purchased your software and as i expected i also worked perfectly." Free trial setup of product converts only first 15 items per user mailbox. Users must try-out demo version before purchasing the product. Full version of product converts Exchange to Outlook data without any limitation and costs only at $299. Deleted, corrupted, inaccessible and unreadable data file recovery is done with best software. Get this amazing tool that restores Outlook data file back in Outlook file. MS Outlook OST to PST file conversion is done using the software that can also convert OST in EML and MSG file after repairing the file. Get back data and open it. Export personal folder file to PDF file and also make it readable over multiple email clients by converting it into EML format and MSG format. Extract Outlook contacts to VCF files also.